Permanent makeup tattoos are quite popular; especially for the eyebrows. Permanent makeup consists of tattoos that are usually applied by a skilled esthetician who has received special training. The most common procedures include eyebrows, eyeliner and lips with eyebrows being numero uno. The latest technique for application is called microblading which looks more natural because it mimics the look of hair. But what happens when the artist gets it wrong? You can come to me and I’ll easily erase or modify it using the PicoSure laser workstation for permanent eyebrow removal. I’ve successfully treated a number of ladies with permanent eyebrows because their artist didn’t quite achieve perfection. Sometimes eyebrow tattoos appear too stark or too dark. The shape may not match the patient’s face or there’s not enough symmetry. Whatever the reason, PicoSure laser tattoo removal can help. 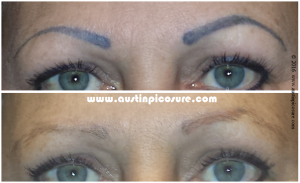 If you have permanent eyebrows you would like to soften, lighten or remove I can be reached in Austin, TX @ my new location: Austin Medspa 512-479-9997.